This expansive survey spotlights pervasive issues affecting girls’ and women’s sexual and reproductive health across the lifecourse. Research from diverse countries around the world analyzes the complex relationships among biological, psychological, sociocultural, and economic issues―particularly in terms of inequities―as they shape women’s lives. Major challenges and possibilities for intervention are examined in their national context and with their global implications, including child marriage/motherhood, reproductive care and access, fertility, childbearing, contraception, abortion, HIV/STIs, gender-based violence, sexual pleasure, and menopause. In these forceful dispatches, a consistent human rights perspective emphasizes women’s control, autonomy, and agency in all stages of their lives. 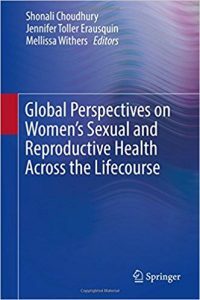 Summarizing an interdisciplinary field on research and practical levels, Global Perspectives on Women’s Sexual and Reproductive Health Across the Lifecourse will be an invaluable text for undergraduate and graduate courses in a wide range of fields, including public health, global health, women’s studies, sociology, anthropology, gender studies, and human rights.